Well another reunion enjoyed by all. The Four Pillar Hotel was an excel-lent selection. The hotel had plenty of space and is in a beautiful part of the country, not far from the quaint little village of Witney. For those who have never visited this part of the country, Witney is a mediaeval village consisting of 17th century houses, town hall and village green and a good smattering of pubs. The party people started to arrive at 12.00 and by 1.00 there were at least 5 or 6 couples in the usual meeting place, the bar. After the normal ex-change of greetings, food and drink was ordered and everyone settled in for a chat. Throughout the afternoon more people started to arrive and catch up. The Friday night as usual was fancy dress night and a chance to catch up with friends old and new. I hope that the people who attended the gala dinner for their first time were made to feel as welcome as we were on our first gala dinner 26 years previously. As usual we were not let down by people getting in the party mode and there were plenty of people in fancy dress. We had the Joker, Hi de hi yellow coats , who by the way won first prize, Mr T , who kept calling every one fool and four very pretty ladies dressed as ghost busters who somehow managed to convince Tim Gibson to dress as puff the marsh-mallow man out of ghost busters. After the meal Brian showed a video of the organ care support machine and spoke about the benefits to the patient and that Tracy Baker from Harefield would be coming to the AGM to explain more about the sys-tem. The evening was spent chatting and before long the clock struck 12 and everyone wandered back to their rooms for bed. On Sat after a fulfilling breakfast, the AGM took place. As mentioned on the front page the members were made aware of the organ care system and were asked for their vote on pledging money towards purchasing OCS for the hospital, which was agreed unanimously. After the AGM a group of happy wanderers fol-lowed Jill and Peter on what felt like mystery tour to a quaint country pub called “The Swan and Minster mill” . This was a delightful quaint country pub set in the old minster village which is over 600 years old. On entrance to the pub not only were we greeted by a nice log fire , but it was a pleasant surprise to meet up with Chris , Steve and a few others . The food was exceptional, and Jill and Peter said they often went there in the summer and sat outside by the river. Once the food was over the group went back to the hotel to get ready for the evening activities and gala dinner . After the meal , Andre Simon presented special birthday pins to Lisa and Rob . 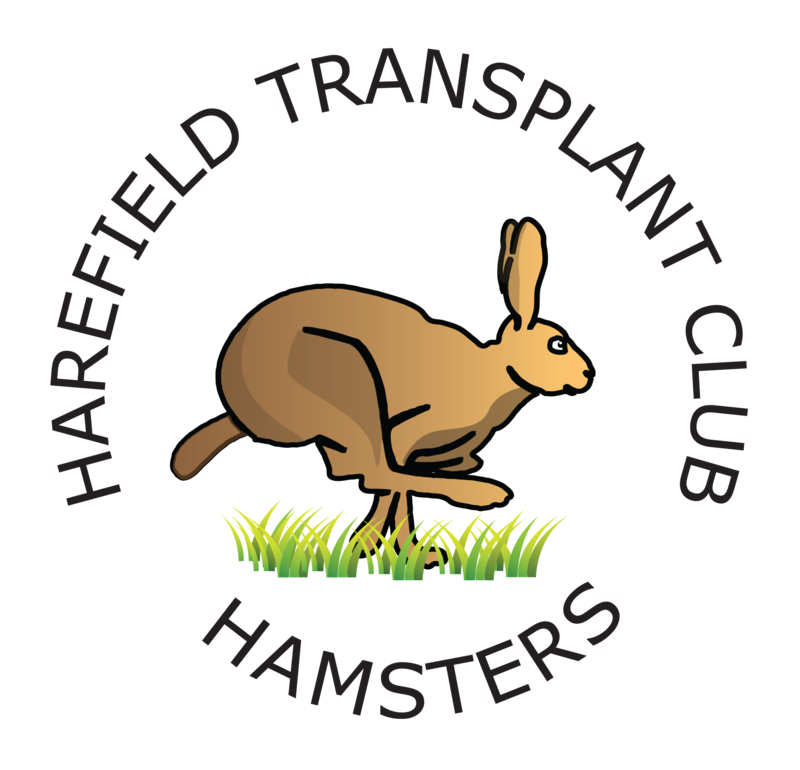 The club announced to the rep from OCS that we would be pledging £20,000 pounds towards purchasing a couple of OCS for the hospital . The raffle was drawn raising over £1,500 for the club funds and the Pinfield cup was presented . I have been called many things in my time but never, a double act , Laurel and Hardy or Flanagan and Allan , so you can imagine Paul and my shock when we dis-covered the cup was being presented to us both . Paul is delighted , it is the only cup he has ever wanted to win since he joined the club. Then in true Hamsters style the dancing started, Gemma the singer was excellent and kept everyone on the dance floor , along with teaching us numerous dance moves. It was all to soon when we were all singing to “you will never walk alone”. Sunday morning was a time for good-byes , but promises of meeting up again , and everyone made their way home.